Both Muss & Turner’s and Local Three get all of their local tomatoes from Bill’s family farm in Canton. The Yoder name is as synonymous with tomatoes as Prince is to music. 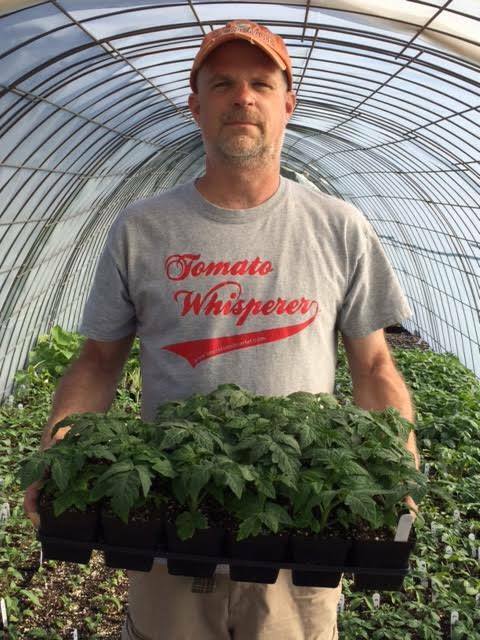 Q: Chef Hall calls you the tomato whisperer, what’s your secret to growing some of the best tomatoes in the area? I would say variety selection and how farmers go about growing are both very important. It’s vital for us to give tomatoes the most optimal environment we can with the keys being proper fertilization and proper watering. As for selection, I am involved in many networks of tomato breeders from around the globe, so I network with them frequently. As a community, we document our growing season and take several photos of our crops to exchange information that allows us accurately select the best varieties that have not only done well for myself, but for others among the community as well. Q: How many varieties of tomatoes would you say you have? I have been growing tomatoes for more than 20 years, so in my overall collection I have 2,500 varieties. This year, I have grown 200 varieties. 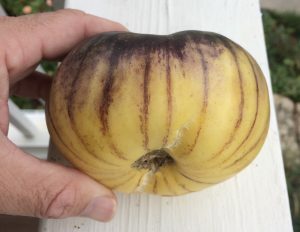 My favorite tomato changes every year, but my favorite this year is called Wolverine – a new creation from a cross-pollination. 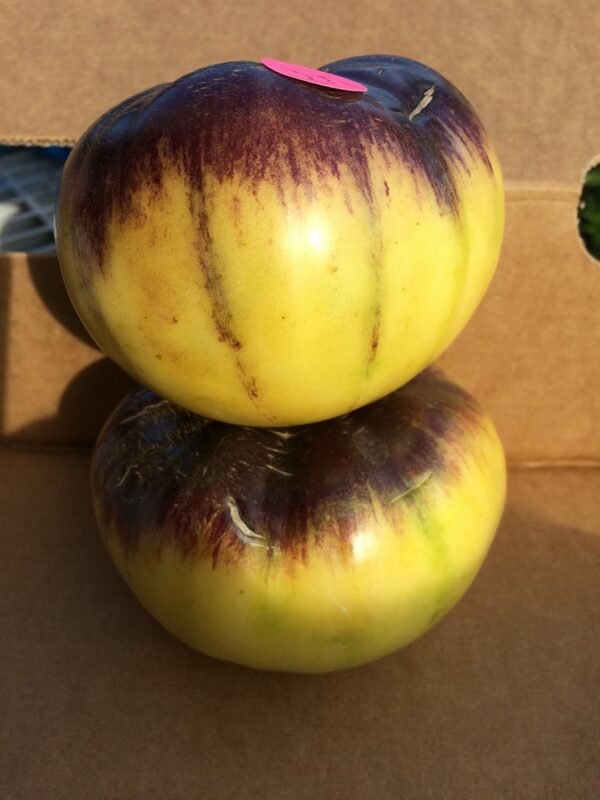 The Wolverine tomato is a whitish-yellow tomato with blue stripes from breeder out of Michigan. Q: Why do your tomatoes taste so good? Varietal selection. I choose varieties whose flavor profile matches my preference similar to the way you would with wine. In fact, many wineries also have tomato gardens and will conduct tomato and wine pairings. I look for a really good full and robust tomato with equal parts acid to sugars. I don’t want it just sweet or just acidic. I want it to have a compliment of both flavors. Q: What’s your favorite tomato dish? It’s simple, but a caprese salad that allows me to taste the tomatoes and not overwhelm them with flavors would have to be my favorite. I just add some tasty tomatoes, a really good olive oil, delicious mozzarella or burrata, salt and pepper, and basil. Q: What’s something most folks don’t know about tomatoes? Every time I teach a class, this seems to be the fact no one is aware of: A tomato is self-pollinating. Folks always ask how I prevent tomatoes from cross-pollinating. But, tomatoes actually pollinate themselves. They have both the male and female organs. By the time the blossoms have opened, it has already pollinated itself before it’s even exposed to bees. So, tomatoes do not need bees to pollinate. Q: What are some of the challenges you face in growing tomatoes? We face enormous challenges. First off, living in Georgia, we are surrounded by poor soil and a terrible climate to grow your own tomatoes. The best growing conditions for a tomato is to have good, light soil that drains well. Moisture, humidity and heat are extremely bad for tomatoes – which we have plenty of here in Georgia. Our goal is to keep the plants as dry as possible. The more the leaves are wet, the more foliage disease you are susceptible to. I’d say the people who are the most successful in growing tomatoes are farmers out in the California valleys. Yes, it’s warm there, but it’s dry and the nights are cool. In fact, many California wineries also grow tomatoes. Q: Do you have any tips for folks at home growing and storing their own tomatoes? For growing, I would say always amend your soil as much as possible. I also always grow in raised beds to add organic matter which lightens up the soil and gives water the ability to drain better. Ideally, space the tomato plants far enough apart to allow them to dry off in the mornings with the dew. Many people cram too many tomatoes in a small space for an area that is harder to dry out. If your soil is really bad, then I would suggest growing in containers. For storage, if you can help it, don’t refrigerate tomatoes! Let them ripen on the counter. Refrigeration deactivates flavor enzymes, essentially turning off the flavors, as well as changes the texture. Bill’s harvest this year has been tremendous. We have been both excited and honored to feature his tomatoes in some of our summer dishes.